A luxury yacht style cruise for up to 40 passengers. Excellent itineraries and some of the best naturalist guides. Isabela II is a medium size luxury cruise ship offering a high-class experience of the Galapagos Islands. Unusually, the ship has a glass bottomed section enabling those who do not wish to snorkel to still discover the thrill od the underwater world of the Galapagos. She is fully air-conditioned and has accommodation for up to 40 passengers. Isabela II has 27 crew members, and 3 Galapagos naturalist guides who are qualified to the highest standards by the Galapagos National Park. 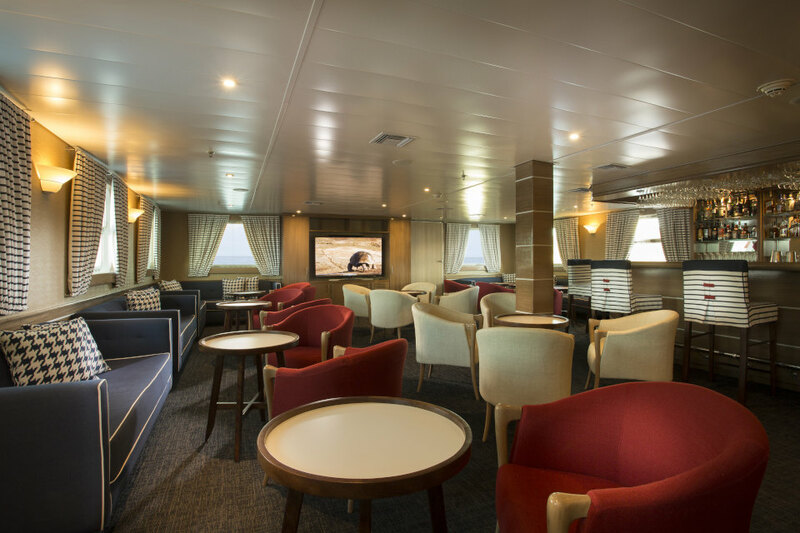 There is a bar, restaurant, sun deck with observation area and jacuzzi, library and 20 spacious twin cabins, all with private facilities and outside view. 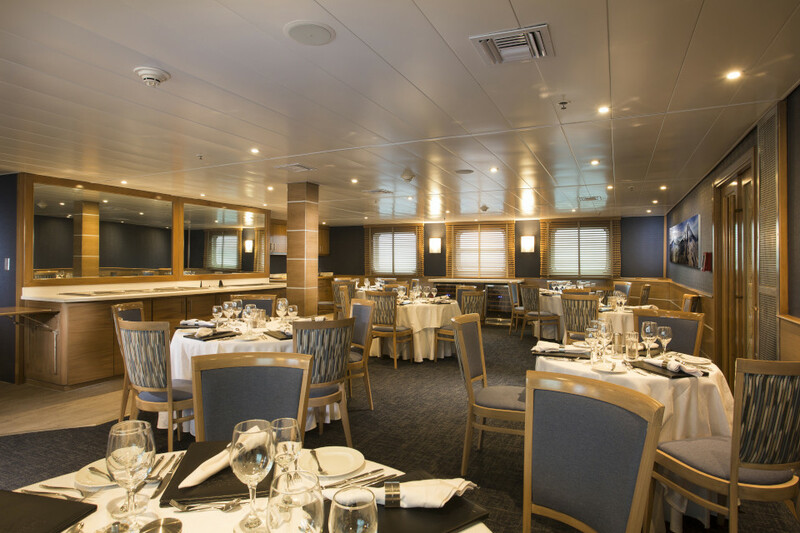 Transfer to the dock and the Isabela II, where we check in, receive an introductory briefing and have lunch on board. After lunch, we land back at Puerto Baquerizo Moreno and drive 40 minutes to the island’s southern shore. At Cerro Colorado, we visit the breeding centre of the highly-endangered giant tortoises in the midst of a fantastic deciduous forest, home to dozens of bird species and the endemic San Cristóbal lava lizard. Overnight, we navigate northbound to the incredible bird island, Genovesa, crossing the equator on the way. The morning starts with a panga ride along the cliffs of this dramatic island, followed by landing with a steep climb (90 feet) up some stairs to reach a flat plateau. Along our walk, we can observe large colonies of Nazca boobies, red footed boobies, great frigate birds and storm petrels. Those not wishing to disembark can enjoy a longer panga ride along the cliffs (depending on weather conditions). We can also enjoy snorkelling and kayaking. In the afternoon, we land at the beach for an easy stroll observing hundreds of birds, mainly frigate birds, red footed and Nazca boobies, gulls, herons, finches and mockingbirds. There’s an optional walk over sharp lava and uneven terrain for dramatic views, or else we can return to the beach to enjoy snorkelling at this beautiful natural harbour. After breakfast, we enjoy a coastal exploration along the impressive cliffs of Buccaneer’s Cove, learning about the area’s distant and recent history. The cove is home to a large number of marine birds, sea lions, and inter-tidal organisms. Enjoy fantastic natural formations such as the “Elephant Rock”, “The Bishop” and an impressive natural cave. This is a great site for snorkelling too! Or ride in our glass-bottom boat. This is a great opportunity to see land and marine birds amid a landscape of tuff-stone layers and lava flows. At low tide, marine iguanas graze upon the algae beds and we can also observe a colony of fur-sea lions. Back at the beach where we land, there’s very good snorkelling and swimming here. In the morning, we visit the youngest island of the archipelago, Fernandina. Punta Espinoza has an amazing combination of barrenness and abundant wildlife. Highlights include hawks, penguins and the flightless cormorant. Opportunity to snorkel. Across the narrow Bolívar Channel, we anchor at this cove on the northwest of Isabela. It provided a favourite anchorage for pirates and whalers over the centuries. An uphill hike takes guests to the rim of Darwin Crater, filled with salt water and to a dramatic viewpoint. After our walk, we take a panga ride to spot local wildlife, with the possibility of swimming, kayaking or snorkelling. After breakfast we disembark at Urbina Bay, the result of an uplifting of the ocean in 1954. Here you can find corals, shells and many other calcareous organisms exposed above water. This area is also home to large and very colourful Galápagos land iguanas, and occasionally to giant tortoises. Along the shoreline, after the hike, guests may encounter flightless cormorants and see penguins while snorkelling. Since there is no landing site at this location, the coastal exploration is by dinghy, while the naturalist guide explains the dramatic geology of the area, with remains of lava flows and tuff stone layers. There is abundant wildlife and, depending on the conditions of the ocean, we’ll be able to snorkel along the cliffs, hopefully in the company of green sea turtles. Expedition plan for Sunday and dinner. In the morning, we disembark at Rábida Island’s red-coloured beach. A stroll allows us to observe a large colony of sea lions, marine iguanas, mockingbirds, yellow warblers and several species of Darwin’s finches. This is a great place to snorkel from the beach. We can also enjoy a panga ride, kayaking or ride in our glass-bottom boat. We arrive at Baltra Airport and then we take you to the Itabaca Channel to take a ferry across to Santa Cruz Island. A 30-minute bus ride takes us to a restaurant in the Highlands of Santa Cruz Island to enjoy lunch, and then continue to Puerto Ayora. After driving down from the highlands, we visit the Charles Darwin Research Station and the giant tortoise pens within an impressive giant prickly-pear cactus forest home to many land birds. These are the headquarters of scientific investigation, conservation and the National Park administration. Late afternoon we stroll along the main street of Puerto Ayora before embarking on Yacht Isabela II. We review the expeditions plan for next day, Captain’s welcome cocktail and dinner. A stunning anchorage provides our jumping-off point for our visit to this sandy white beach with many sea lion harems. Galápagos hawks are often easily observed, perched atop salt bushes. The endemic land iguana, unique to this island, may be spotted during the walk. Snorkelling and swimming from the beach, kayaking or a ride in our glass-bottom boat rounds off the rewarding experience. The turquoise waters of the channel here contrast brilliantly with the white sand and black lava of the shoreline, while a carpet of scarlet sesuvium succulents serves as groundcover for a grove of luminescent green prickly-pear cactus beyond, populated by yellow-gray land iguanas. Along the coastline one finds sea lion colonies, while sea birds play with the thermals that form along the cliffs of this small but amazing island. After WWII, US military barges were beached and abandoned here. Locals referred to the beach as the barges beach, a name that morphed to “bachas”. Today it is an important nesting area for the east Pacific green sea turtle. Located on the north shore of Santa Cruz Island, it is a glorious white beach, with several brackish lagoons only a few steps away from the sea. These lagoons are the feeding grounds of various wading birds, from stilts to flamingos. We can swim and/or snorkelling from the beach. Thursday’s expedition plan review and dinner. This morning, a Galápagos icon awaits for us: Bartolomé Island. A great way to start the day, with a steep climb up a wooden staircase: the view from the top is worth the effort! Following the walk, we take the dinghies for a ride around colossal Pinnacle Rock, followed by time we will enjoy the beach and some snorkelling. We can also ride in the glass-bottom boat for great views of the underwater world. We arrive at Baltra Airport and transfer to the Itabaca Channel to take a ferry across to Santa Cruz Island. A 30-minute bus ride takes us to a restaurant in the Highlands of Santa Cruz Island to enjoy lunch, and then continue to Puerto Ayora. After driving down from the highlands, we visit the Charles Darwin Research Station and the giant tortoise pens within an impressive giant prickly-pear cactus forest home to many land birds. These are the headquarters of scientific investigation, conservation and the National Park administration. Late afternoon stroll along the main street of Puerto Ayora before embarking on Yacht Isabela II. Expedition plan review, Captain’s welcome cocktail and dinner. serving as a post office in the archipelago for over two centuries. Snorkelling off the beach. Our visit to Punta Cormorant takes in an olivine-crystal beach for an easy walk by a brackish water lagoon where bird species like greater flamingos may be observed. On the other side of the island, we come to a white-sand beach where sea turtles come out at night to nest. We can usually snorkel at “Champion Islet” site, panga ride or ride in our glass-bottom boat. Our morning outing at Punta Suárez provides an exciting walk on lava/boulder terrain to visit its unique sea bird colonies, including the waved albatrosses (April - January), boobies, swallow-tail gulls, and the famous “blowhole”. Also, look for red-green-black marine iguanas. Back on board for lunch. In the afternoon, we set down at this beautiful, white coral beach for a short walk to observe the sea lions, mockingbirds, finches or enjoy the beach. There is great snorkelling in this area, or else there’s time to kayak, panga ride or ride the glass-bottom boat. In the morning, we land on the eastern tip of the island. The trail that ascends from the beach provides spectacular views of the shoreline and is the only site in the Galápagos where the three species of boobies can be found together, as well as the two frigate species, plus a colony of bachelor sea lions. After the walk, if conditions are favourable, there is a chance to swim, kayak or snorkel from the beach or a panga ride. In the afternoon following lunch on board, a dinghy ride along the shores of tuff-stone layers takes us to Cerro Brujo's expansive, white coraline beach, great for walking, with rewarding birdwatching with good views of seabirds and shore birds. Also, look out for Galápagos sea lions. These are the same shores that Charles Darwin walked upon, back in September 1835. After the walk, there is a chance to swim and snorkel. After breakfast, we depart to pier and airport for our flight back to the mainland. The Isabela is a luxury boat offering an unforgettable cruise experience. The 40 passenger yacht includes all a guest might want or need for the best possible cruise of the Galapagos. Social areas are designed to perfection with a jacuzzi, gym, bar, boutique and library with books and videos on the nature and history of the Galapagos. Furthermore, guests can enjoy the observation and sun deck for prime whale watching or enjoy the lounge area outside to sunbathe. The Isabela II also has a special glass bottom boat, offering a perfect view the ocean life below the surface. Snorkelling and snorkel equipment is provided on the yacht as well as kayaks in order to venture out on the water on your own or with a partner. Multi media natural history lectures. FREE WiFi and Internet access in public areas.